This site is situated in quiet countryside surroundings between the historic border city of Carlisle and the local village of Dalston with a view of the local Cumbrian fells. 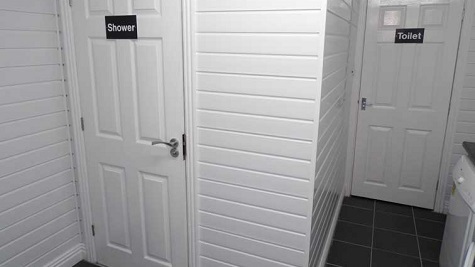 Easily accessible from the M6 motorway north and south. The site itself sits on a level 2 acre field with spacious large hard standings. Each standing having enough room for an awning and a spacious grassed area between pitches. Each pitch has its own electric hook up point, fresh water supply and waste water disposal point. 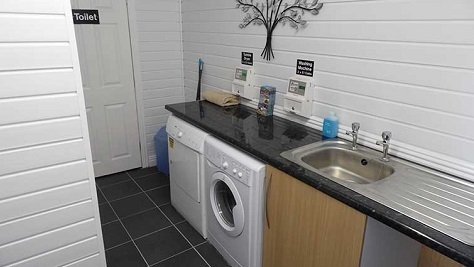 Facilities : Electric hook up available, Easy access, Suitable for Caravans and Motorhomes, Hardstanding Serviced pitches, Toilet, Shower, Laundry facilities, Dogs allowed, Self catering, Swimming Pool, Sauna and Jacuzzi, TV reception good. Nearby : Public transport, Shop, Cafe/Tea room, Pub/Restaurant. We spent 4 nights on this site having been allocated a pitch number when booking, which I thought was a good idea in case we couldn't be personally met on arrival. The site is located to the rear of a sales/servicing business, which at times was busy but not intrusive as the CL is well back from the activity. The pitches are hard standing separated by grass and are a generous size, well separated and level. A water tap and drain is located on every pitch. 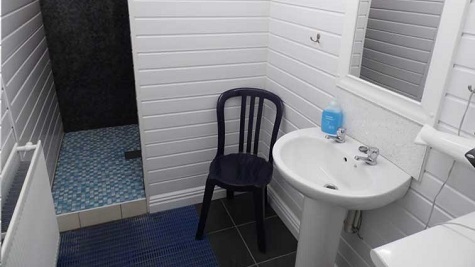 A clean and tidy large toilet and separated shower is provided and a reasonably priced washing machine and tumble drier is also provided. The swimming pool is a waste of time as it has to be pre booked and works out very expensive unless at least 6 or 7 of you share the price. The owner was in no rush to take my money saying at least twice, - 'oh see me later, there's no rush'. In the end I had collar him with money in my hand as we were leaving the day after. There is a busy road which passes in front of the premises, but the pitches are well back and no disturbance was experienced. Phone and tv signals were very good. The view from the pitches was only onto a grassed area but was pleasant enough. Each pitch and the whole site was lit at night. The EHU's were only 12 amps so you had to be careful what you switched on together. All in all, a smashing site well worth another visit if only to get in more visits to more places of interest, having had a good nights sleep. Great location! Good overall but a few snags! We stayed on this site for 5 nights from the 11th July! Booking was easy. We were greeted and shown to our pitch which was level and spacious. Good clean facilities. Great location with easy access to the coast, Hadrian's Wall, the Lake District and the city of Carlisle. We had days out in all these places. The site is part of a caravan retailer business so there's lots of caravans on site albeit empty. This creates quite a busy atmosphere. Also there is caravan storage which is accessed through the CL. Although there wasn't too much traffic it was intrusive having cars coming in and out driving at speed which wasn't safe in my opinion when there were young children about! We would stay here again but only as an overnight stop rather than as a holiday base. We stayed at this site in March as we were going to a concert in Carlisle. The site is lovely and the facilities excellent. Carlisle was within walking distance following the Cumbria way. We only had one night so didn't have chance to explore the wider area but would stay here again. The road outside the site is quite busy which is why we have only rated peace and tranquility as 3. We were here in September, and really liked it. We arrived quite late due to having to wait in Wales while we had a repair done to the water system, but it was not a problem. Just drove in and pitched up on the pre-allocated pitch. We were so impressed we added an extra nights stay on our return trip from Scotland, and would definitely go there again. There is lots to do in the area, especially if you like anything Roman. Directions : Leave M6 Junction 42. Take unclassified road signposted Dalston. In 1.9 miles at staggered cross roads continue straight on signposted Dalston. In 2.8 miles after river bridge at T junction turn Right onto B5299 signposted Dalston/Carlisle. In 1.9 miles on Right Dalston Hall Hotel. Keep straight on. Site on Left in 0.6 miles signed "Dalston Leisure Pool".